SAYBROOK TOWNSHIP - "It's all about the martinis," is the mantra that fine dining aficionados have delighted to discover at Martinis! Restaurant and Lounge. 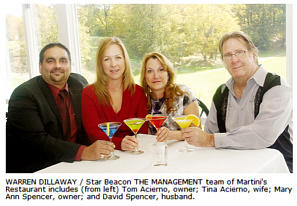 "We opened our doors on Nov. 17, 2008, and have been growing and having fun ever since," said Tommy Acierno, who co-owns the restaurant and lounge located at the Harbor Golf Club, 4338-48 Lake Road W., with Mary Ann Spencer. "We picked the name Martinis for our restaurant because a martini drink is featured on the backs of our bar stools," Acierno said. "Our lounge is a festive, inviting place." The lounge has two flat-screen TVs, wine rack and a popcorn machine, and features more than three dozen martinis on the martini menu. "This is a warm and friendly room, and our staff makes a point to get to know everyone by name," Spencer said. "Many people have met and became friends right here." Situated on a knoll, the dining room has a "to die for" view of the golf course and can seat comfortably between 48 and 60 people. Martinis is fast becoming a hot spot for successful banquets, weddings, parties, reunions, corporate meetings, luncheons, fund raising events and more. The ballroom seats 125 people with a large dance floor, or can seat 160 people if the dance floor is not desired. "It is a lot of hard work putting together a large party, but in the end when people tell me everything was perfect, that is very satisfying," said Banquet Coordinator Tina Acierno. Spencer and Tommy Acierno have a long culinary history and have worked together at two area upscale restaurants for more than 18 years. "We worked together for many years at Lou's Billow Beach, and after it closed, we went to work at the Bridge Street Bistro," Spencer said. "We are very grateful for the many people who followed us here to Martinis." Martinis' secret to success is quality, freshly prepared food; excellent friendly service; a strategy for creative marketing; and they keep things fun with a variety of entertainment. "Of all our dishes are created here and made fresh by our Chef Eric Kerns," Acierno said. "His soup creations are phenomenal; his vegan vegetable soup was unbelievable, he also excels at the grill." Acierno also said Kerns really shines at banquets and weddings with his amazing food that consistently gets rave reviews. Martinis employs between 24 and 27 people, and 80 percent of the staff were with them when they opened, Spencer said. "We boast about the friendliness of our staff, they treat all of our guests really well," she said. "We believe in keeping things fresh and fun, so we have parties, bring in bands and comedians that are appropriate for different age groups," Spencer said. In fact, to help couples celebrate Sweetest Day this Saturday, local saxophone player Don Perry will be performing romantic music. On Nov. 17, the Light of Day band will be playing to help Martinis celebrate their second anniversary. "I have so much fun playing with our menus and featured dinners, plus meeting new people makes it fun," Acierno said. Martinis is open for dinner, 5 p.m. - 10 p.m., Monday - Thursday, 5 p.m. - 11 p.m., Friday and Saturday, 4 p.m. - 9 p.m., Sunday. The lounge is open at 3 p.m. daily. Walk-in business is welcomed, and reservations are encouraged. For reservations, banquet sales and further information, contact Martinis at 440-964-2800.